Jaguar’s long anticipated, long overdue E-Type replacement is THE car of the moment. So we had to get our hands on one to see what all the fuss is about. We tested the middle of the range F-Type S, its 3.0 litre supercharged engine produces 380 BHP and 460 Nm of Torque. 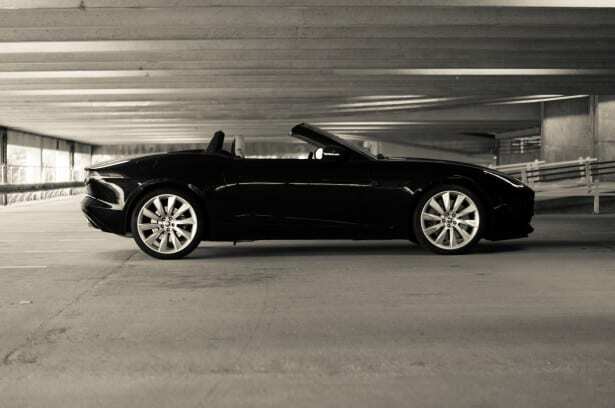 Meaning the 1,614kg, all aluminum drop top shoots from 0-60 in 4.8 seconds, and on to a top speed of 171 MPH. Ferrari Enzo said the E-Type was “The most beautiful car ever made” so its next of kin best be a looker. And boy is it that! In many ways it’s a modern take on the E-Type, the way the front lights are mounted at the outermost corners, and the thin, delicate, slit like brake lights are a certain nod to the infamous classic. This big cats rear haunches bulge out slightly, before pinching upward in a very ‘79 Corvette Stingray manner. A low, slightly sloping boot lid features an integrated spoiler which activates at 60 MPH, helping create an extra 120kg of down force. It can also be strategically deployed via a ‘poser’ button near the gear stick. As soon as you press the bronze start button the F-Type roars into life, gauges sweep round and the 3.0 litre supercharged engine revs before calming back down to a purr. Press the throttle to the floor, and you are greeted with a deep raucous growl as the revs hit 4,000 and the Jag wobbles from side to side. It’s a bit addictive! Now with this being the S model you have the Active Sports exhaust as standard – normally a £1,630 option on the standard F-Type – meaning you have a clever little switch that reroutes the exhaust gasses; basically making it a straight through system. Buyers will have this switched on 99% of the time I reckon! When activated the aural delight that ensues is simply astounding, you feel like you’re in a rally car. With each downshift it crackles and pops, the overrun is simply divine! Leaving the car in manual is best, first and second gear are the real head turners. It’s always worth downshifting just one too many to be swathed in those burbling notes. Some have moaned about the automatic ZF gearbox in the F-Type…personally I wouldn’t have it any other way. With that amount of power, changing gear at the flick of a finger enables you to keep pace and accelerate onward blisteringly quickly. If you are feeling lazy and want to leave the F-Type in full auto it’s still an excellent ‘box. Quick to change down at a moment’s notice when you push the ‘Go’ pedal all the way down. Steering is very direct with great weighting to it, for an even sharper response you can pull down on the ‘Dynamic Drive’ button. This allows you to set the cars parameters to your suiting, we set everything to Dynamic. Throttle response becomes even sharper, along with the steering and suspension. Weight distribution was high on Jaguars list when creating the F-Type, so much so that the battery and washer bottle are situated in the boot. Helping the Jag to have a weight distribution of 52/48 front to rear, and you really can feel how well balanced it is. Under braking or acceleration the F-Type stays flat, no dipping or lifting at all. Cornering is also pitch perfect with a minute amount of body roll, but the active dampers do a great job keeping the car stable. Oh, and MPG isn’t the best, we averaged 12.1 over roughly 100 miles. Meaning it cost us – near enough – 50p a mile. However I’m sure if you left it in full auto you would get nearer the 22 MPG Urban figure Jag quote, just don’t expect too much more! 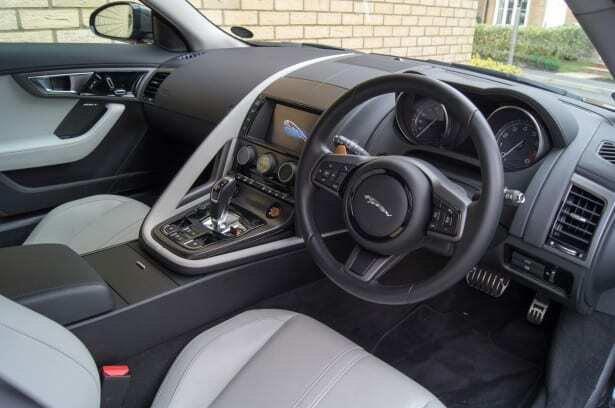 Inside the F-Type everything is driver focused, Jaguar have pitched the car as a 1+1; meaning the passenger is purely along for the ride. The whole dash is aimed toward the pilot, everything is within reach so you can focus on driving. Our car was fitted with the performance seats, at £1,350 they are a rather pricey option but they really do look the part. You are hugged and held in all the right places, making you feel part of the machine. Quality is great, the two tone leather dash matched the seats, and the matt finish carbon fibre centre console trim was stunning. At £67,000 the F-Type V6 S is rather pricey, if it was £20k less it would be an absolute bargain. But it seems JLR have priced it to attract premium customers only, which is a shame as it could really blow the competition out of the water at £50k for the S model. All that being said the F-Type is superb. That noise simply gets under your skin, you want more of it, you find excuses just to start it up, it’s infectious. A test drive WILL leave you wanting one.